A huge gaping sinkhole emerged overnight near the village of Neledino in Russia’s Nizhny Novgorod Oblast region. The 32 metres wide and 50 metres deep sinkhole is large enough to swallow a 16-storey building, and was first discovered by the farmer who owns the field in which the hole appeared. Police taped off the area around the hole to prevent people from falling in to the hole, in case it got any bigger. 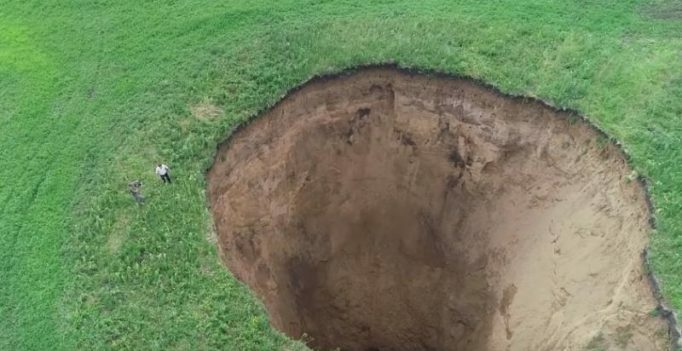 Based on media reports the field has been unused for the past two years, and the sinkhole is believed to have been caused by the dissolution of soluble rocks. The Russian Ministry for Emergency Situations is monitoring the incident and investigating what may have caused the hole to appear. Sinkholes can form suddenly or gradually, and this isn’t an uncommon phenomenon. The huge hole opened up on July 25.